While whale watching off Northern Vancouver Island in British Columbia, Canada, a Killer Whale gives passengers aboard a boat tour a tail lob display. Many of the Northern Resident Killer Whales return to the waters off Northern Vancouver Island in British Columbia, Canada on a yearly basis during the summer and fall. A variety of businesses offer whale watching tours during this time and take passengers amongst these gentle giants to see them perform various behaviors, one being a tail lob. When a Killer Whale performs a tail lob for the passengers on a whale watching tour, the cameras are clicking and yells, oohs and aahs can be heard from everyone on board. 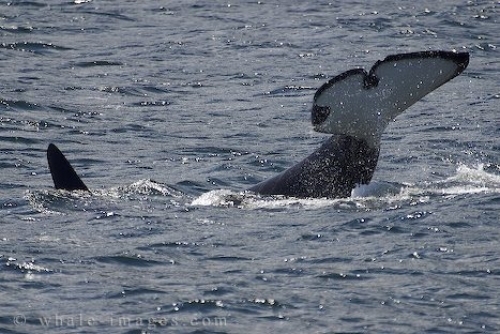 A tail lob could be an act of play, a sign of dominance or the matriarch trying to keep her pod in line. No one knows for sure the meaning behind a tail lob but scientists who have been watching and studying the Killer Whale population for years have deemed these to be the most appropriate reasons. The echoing sound when a Killer Whale slaps his tail on the surface of the water can be heard for miles on a calm day. These animals will also use their tail to play amongst the kelp beds where they catch it in the notch between their flukes and hold it above the surface of the water. The tail fin on a killer whale is divided into two lobes, each one being called the fluke which are flat pads of very strong, thick, connective tissue with no bones or cartilage in them. A Killer Whale uses its tail flukes in an up and down motion to swim gracefully through the water and with some large males, the flukes can measure 9 feet from tip to tip giving them a powerful tool. Passengers aboard a whale watching tour off Northern Vancouver Island may also see other typical behaviors such as breaching, spy hopping, pectoral fin slapping, dorsal fin slapping and foraging. A look into the Killer Whale's natural habitat opens the eyes of many while on a whale watching tour.